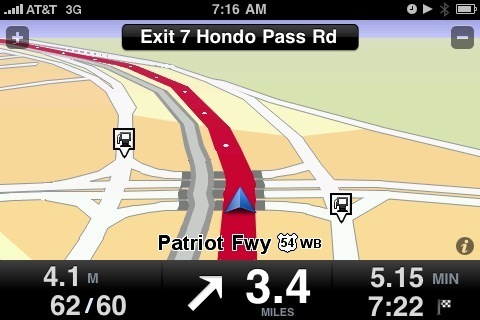 I’m pretty happy to have been able to get the TomTom app for iPhone, thanks to an unexpected honorarium I received. The app is on sale for $49 for a couple weeks. I use the GPS feature on my phone quite often. It will be very nice to be able to drive without having to keep watching the phone. That’s not very safe, especially when you don’t know where you’re going. I turned it on this morning on my way to church and noticed something interesting. It told me that my exit is “Hondo Pass Rd.” It is true that a couple of the highway signs read “Hondo Pass Rd,” but most others read “Hondo Pass Dr.” I have also seen it printed “Hondo Pass Ave.” Apparently, no one seems to know what kind of road Hondo Pass is. I have noticed that most people in El Paso don’t even bother with the type of street. Rd, Dr, Blvd, St, Ave, Way, Cir—those don’t seem to matter around here. I noticed that the first time I looked at Trinity’s directory when I was deliberating the call here. That’s so different from the way it is, for example, in the Minneapolis area, where all the streets run east/west and the avenues run north/south. That way, if I have an address, I can pretty much guess where it’s at. That was rather useful to me the summer I spent delivering sod in Minneapolis. I suppose that being able to locate nearly any address on a grid of streets would eliminate the need for GPS, though, wouldn’t it?